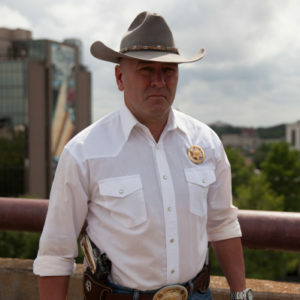 Captain Clay Higgins is a lifelong resident of Louisiana. He has served Acadiana in Law Enforcement for the last eleven years and currently serves as Deputy Marshal for the City of Lafayette. Captain Higgins has become one of the nation’s most influential cops, regularly speaking to law enforcement agencies across America. Higgins is a strong advocate of what he calls… “The sacred oath of the badge”. He states that the sworn oath is not to a Sheriff, or a Chief, or a Marshal… It’s an oath of allegiance to the Constitution. He is a passionate defender of the Bill of Rights. As a Christian, Higgins is known for his refreshing focus on the power of the individual to be redeemed. Higgins received his initial training in police work when serving as a military police officer in the United States Army.